It’s done. And to me, it’s perfect. 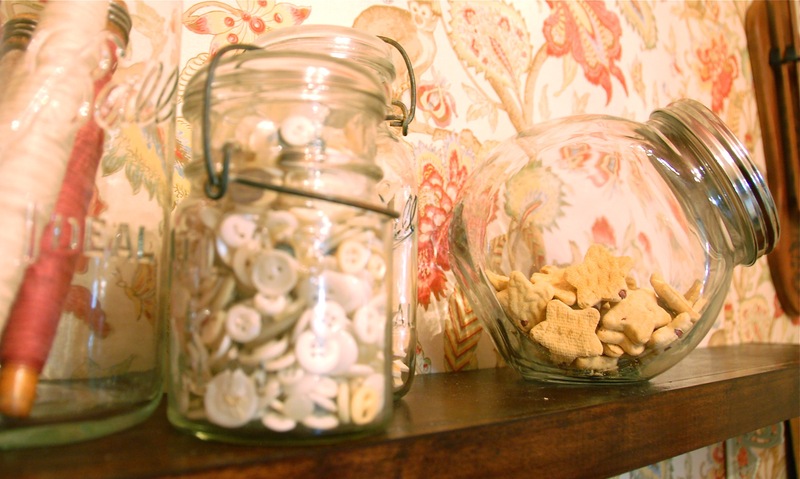 Someone asked me what my favorite part of the room is…. ….the answer is : the way I feel when I’m in it. It’s the happiest little room. 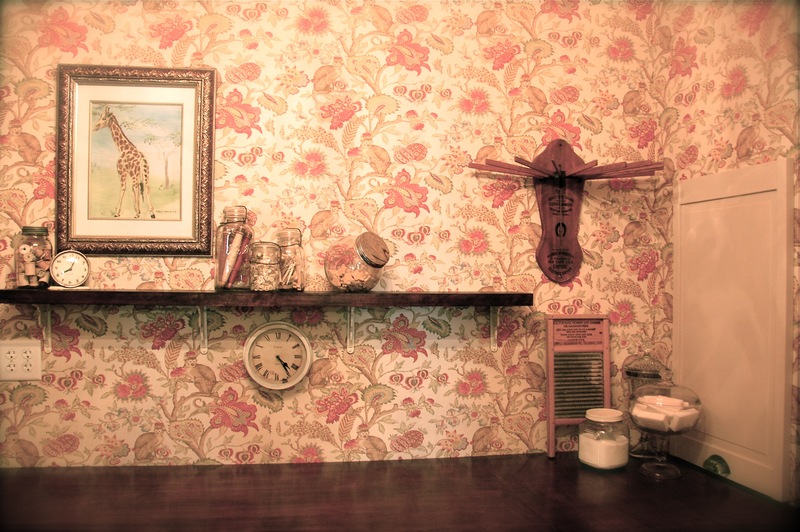 If I had to pick a physical feature of the room, I probably would say the monkey wallpaper. 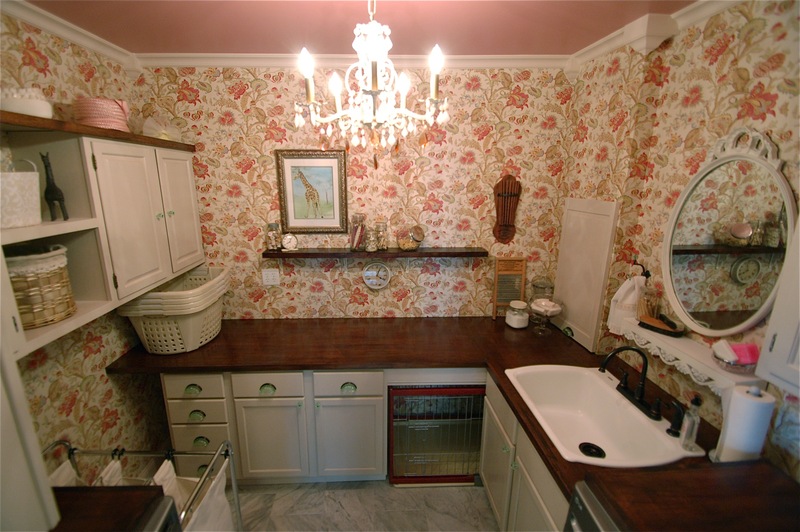 Or the countertops. 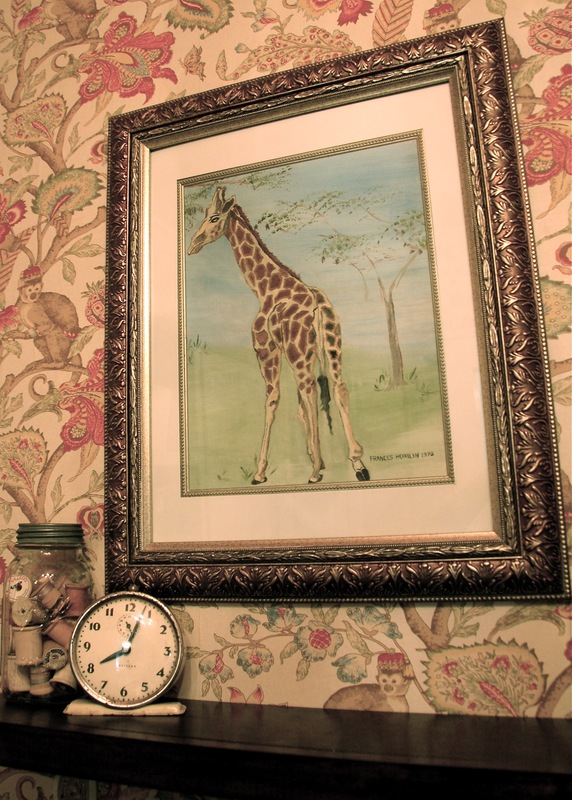 Or the giraffe painting. And yes, you can come and do laundry. 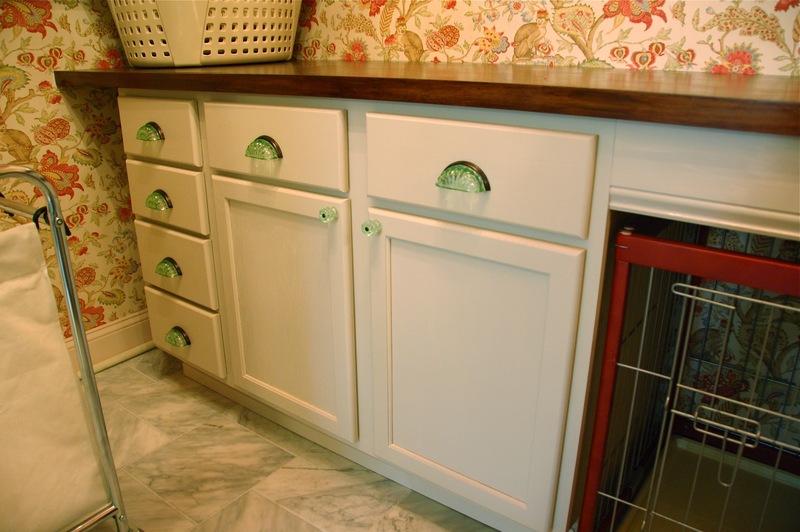 I think every room should make you smile and feel good, even if it’s a room for chores. ESPECIALLY if it’s a room for chores. Paint it a fun color. Add some art. Whatever. Just make it fun! The layout wasn’t what I had originally planned, which is why it’s always good to do a dryfit of the room. 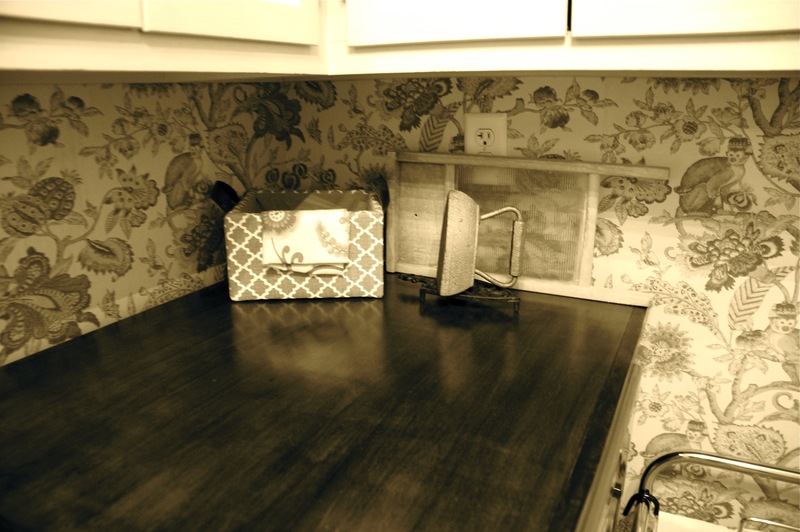 What I ended up with after changing the floorplan, was a longer stretch of countertop, AND the unplanned bonus of not being able to see the modern appliances when you are looking into the room from the kitchen – which I LOVE LOVE LOVE. 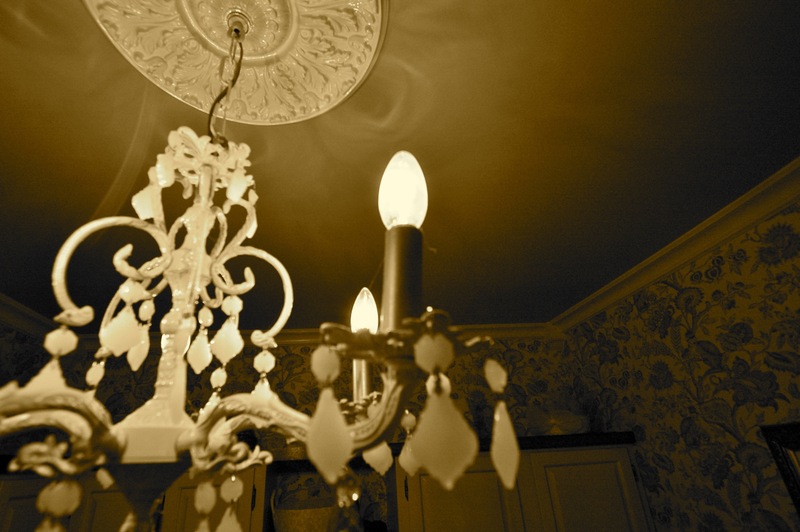 I spent almost nothing on this chandelier refinish. 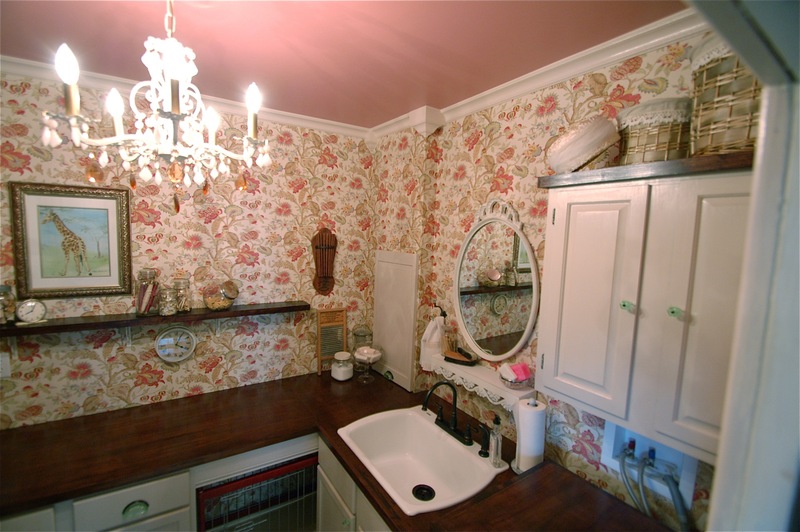 The medallion came from the old kitchen, and the chandelier from the entrance hall, where it was undersized. I had old scrapbook paper to make the candle covers, and I used leftover rose-colored crystals from the Jackson Street bathroom remodel. The only thing I bought was a can of spray paint and the milk-glass crystals, which I found for a steal on E-Bay. 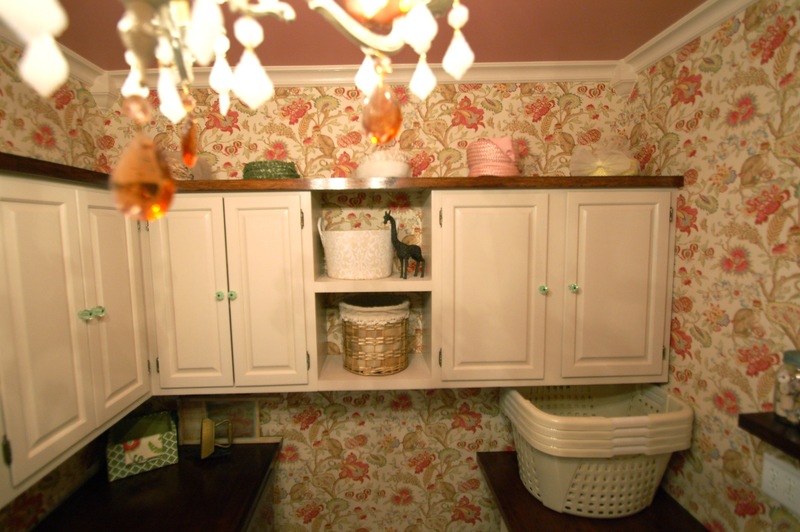 It might seems silly to put a chandelier in a laundry room, but if it makes you smile, then do it. 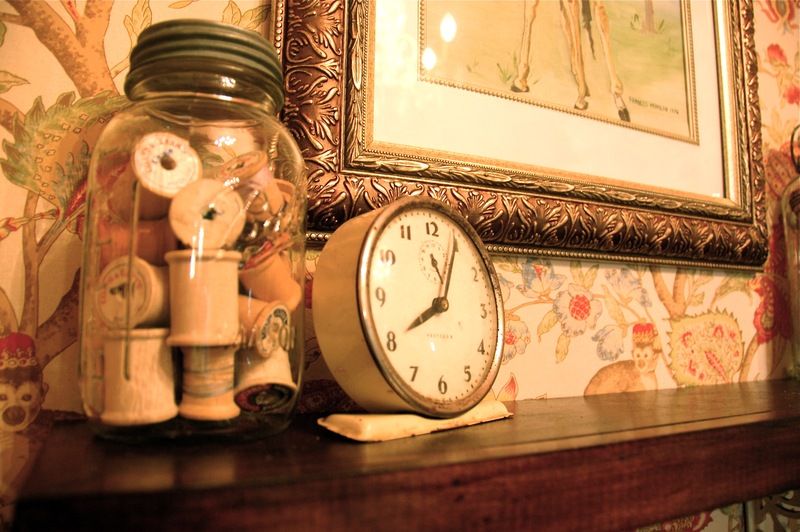 The display shelf features a lot of vintage items…. 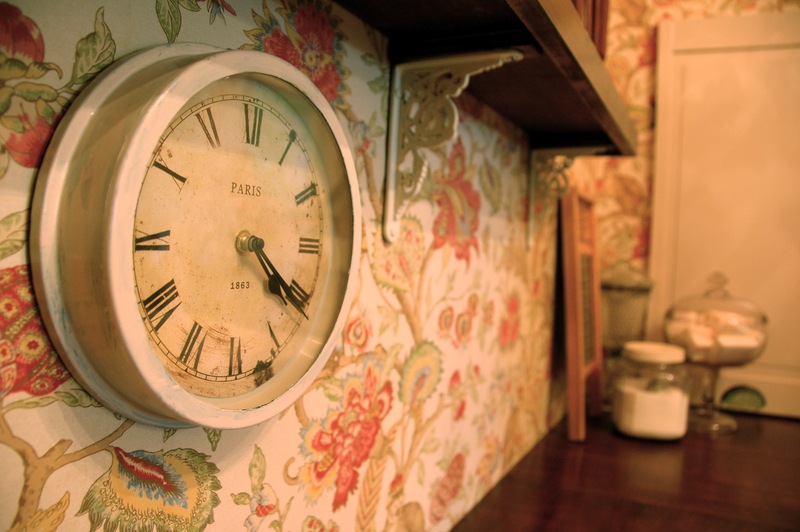 This little vintage gem of a clock came from Franklin Heritage Architectural Salvage. Go there and buy things!!! I love giraffes. Doug and I found this oil painting, painted by his grandmother Frances Heavilin in 1978, at his mother’s house. 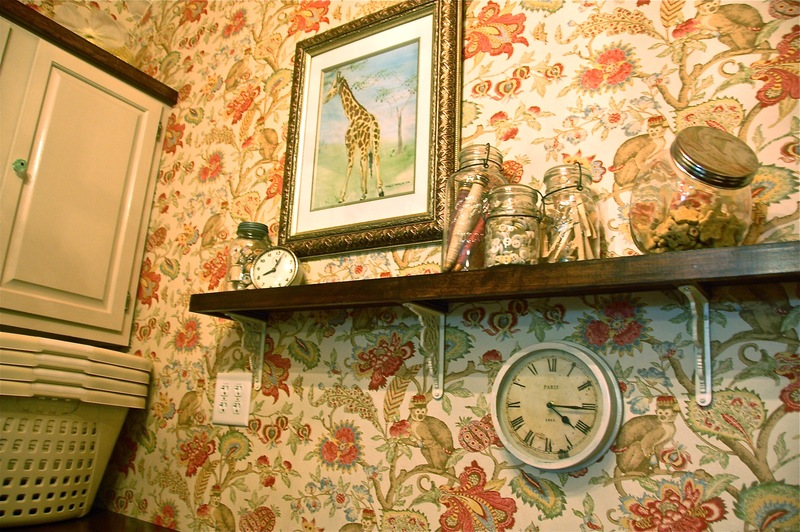 I figured : giraffes and monkeys work together, and the colors work PERFECTLY with the wallpaper. I found a frame that worked, framed it, and did a bit of copper faux-finishing to connect to the oil-rubbed bronze found throughout the room. It’s a fun family piece in an unexpected space. 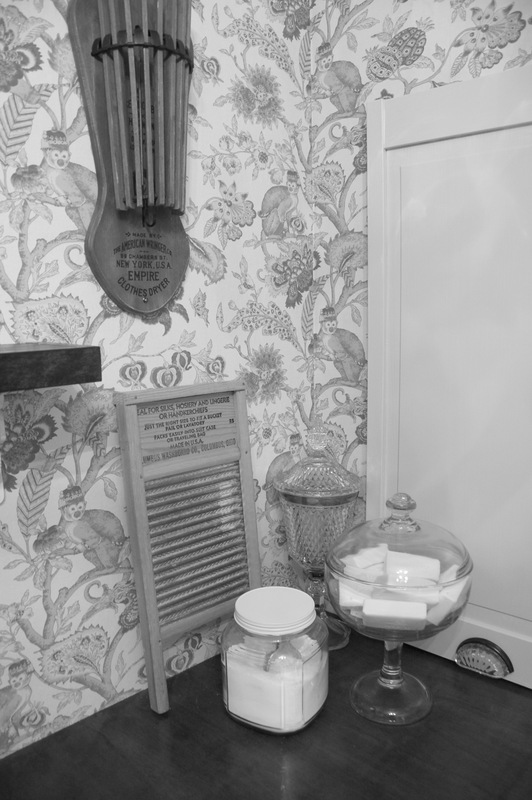 There are some other vignettes throughout the room, like the Victorian Reproduction drying rack, washer board, and glass containers with laundry soaps and regular soaps. 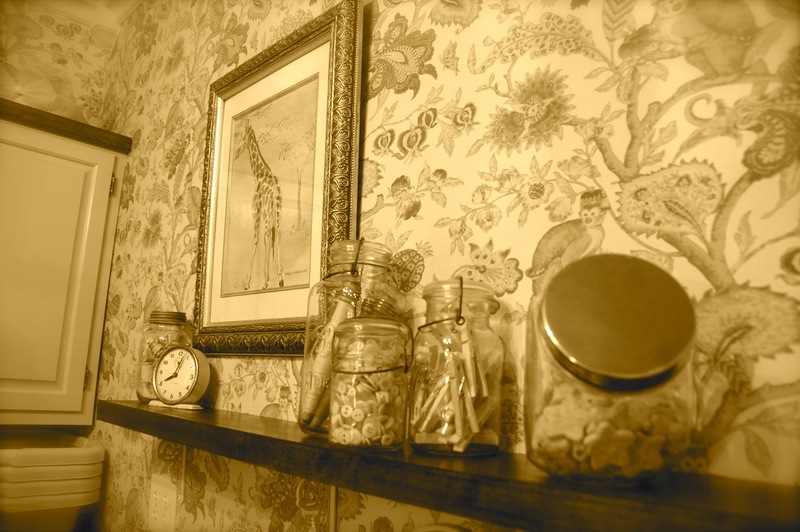 Even though it’s a modern, high-efficiency room, I like having things in here that you would have found in a washroom during the Victorian time period. I’m dying to own THIS, but it’s not in the budget. YET. 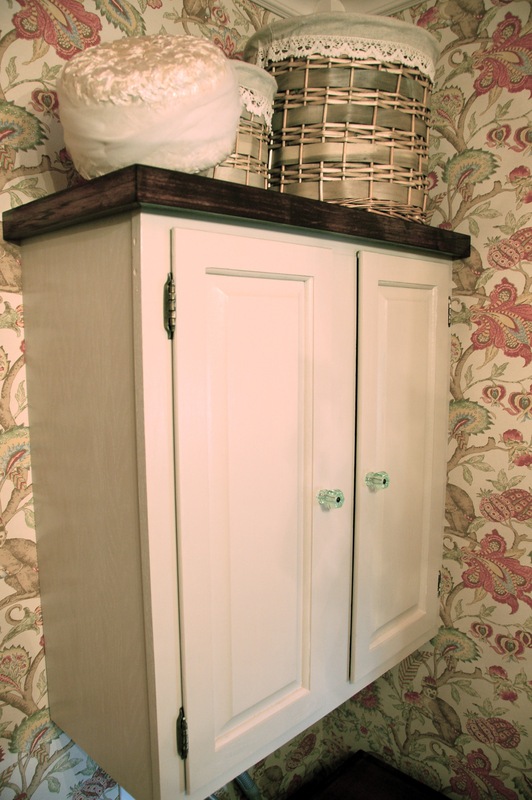 The cabinet toppers look GREAT, and really tie all the cabinetry together. Vintage hats above are fun – I hope to build some hat stands in the future to showcase them even more. 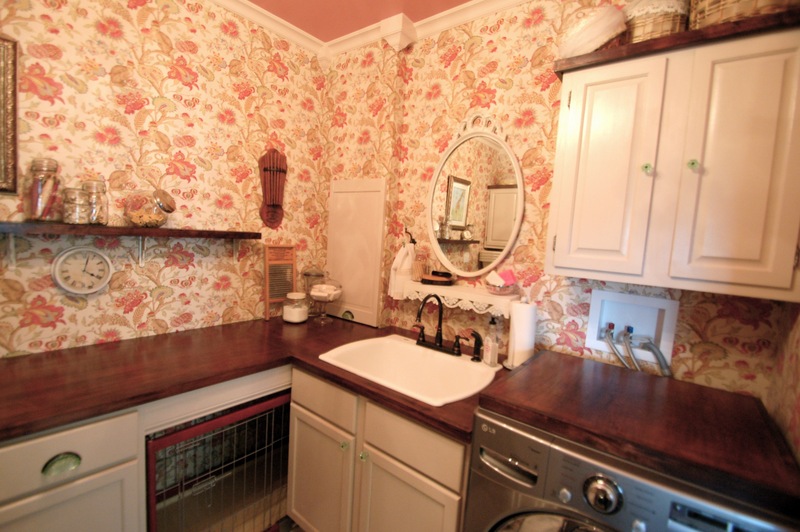 The sink area is adorable. And super functional! 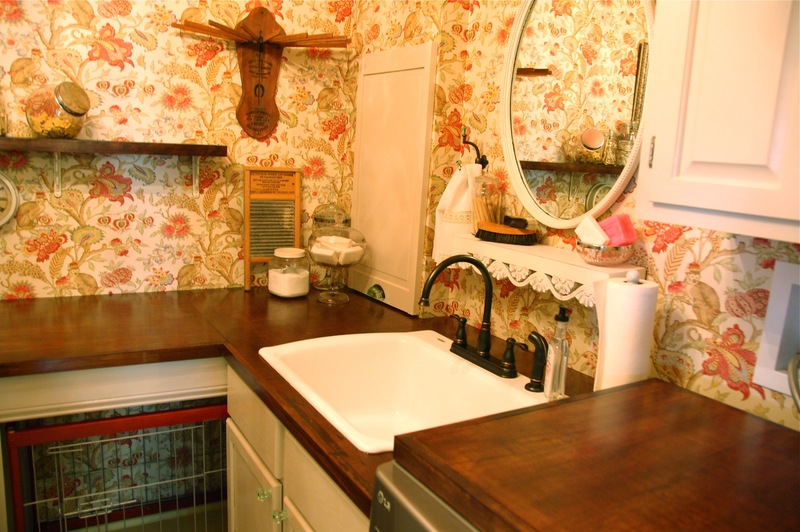 The sink was salvaged from the kitchen when we moved in here. 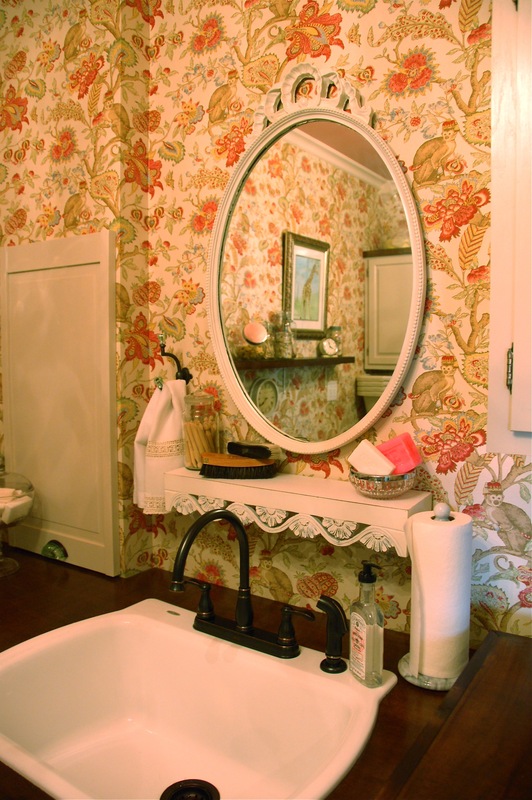 The mirror was a relic from buying Jackson Street. And the shelf was a present from my mom years ago. It’s amazing how lovely you can make a room by shopping among your own things, especially when trying to keep the budget down. 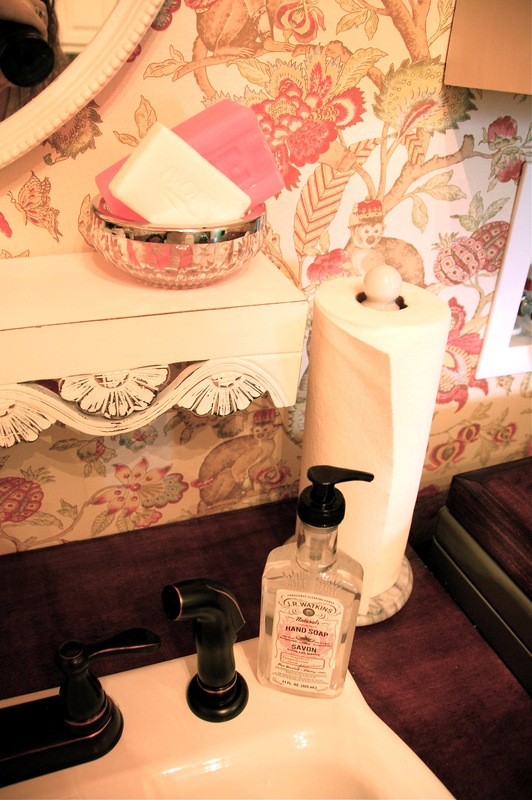 Some olde-timey soaps and valet brushes, and vintage hand towels round out the sink area. 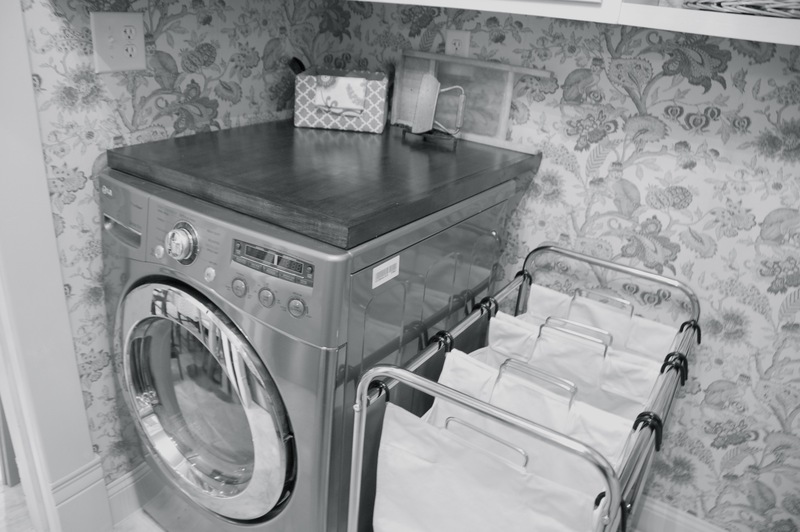 The dryer side with laundry sorters. 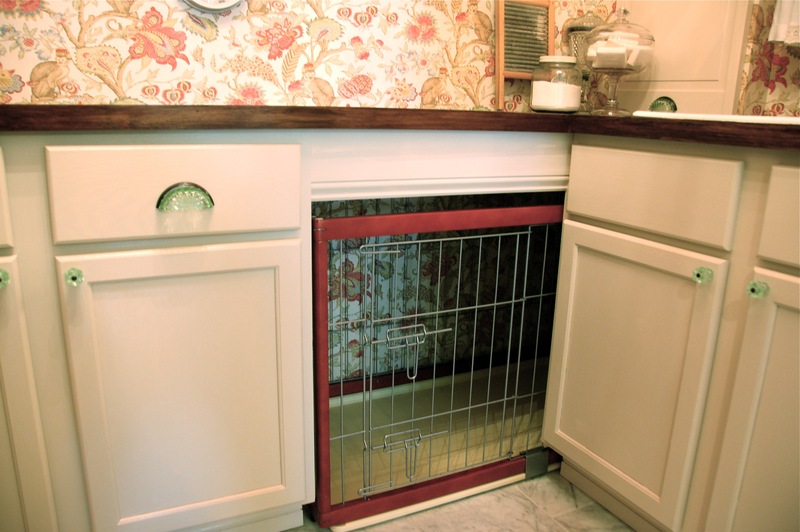 The dogs have a cute new home, too! 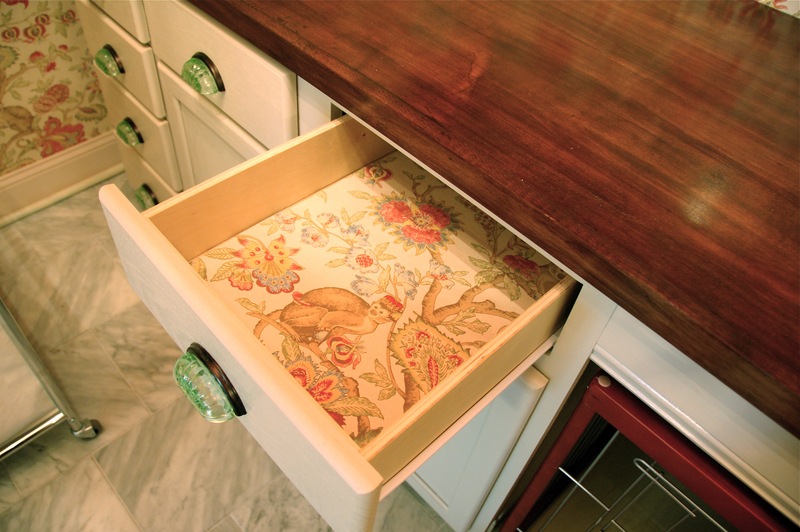 Leftover wallpaper in the drawers! 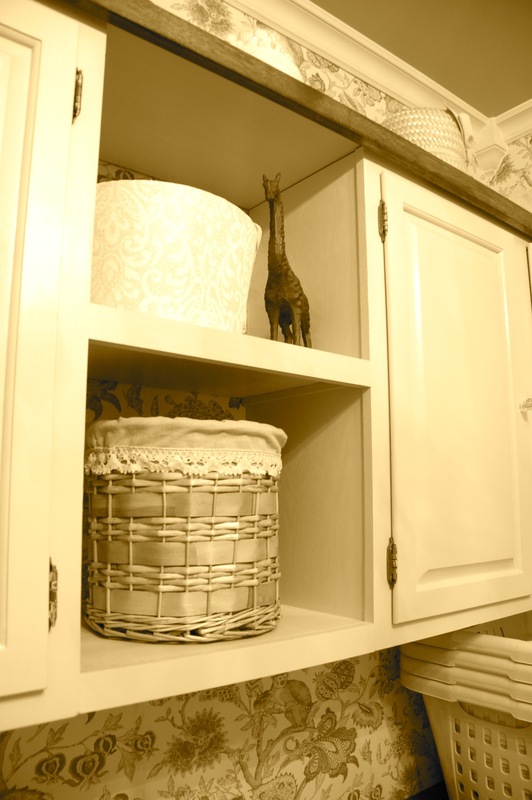 It’s amazing how the right hardware makes the cheapest off-the-shelf cabinetry look like furniture. Tell me what you think! If you love this room (or hate it! ), feel free to pass the link along. Because I’m super excited about it! 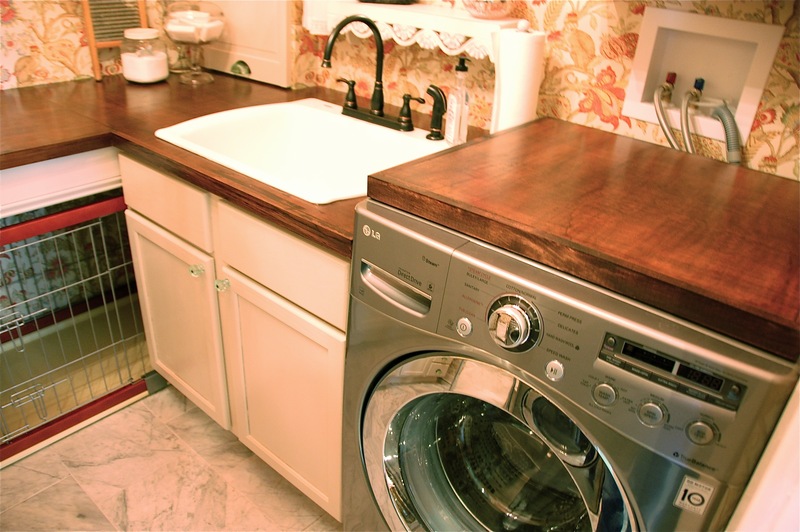 And if you’re just joining us, you can how the room progressed in the Martin Place Laundry Section of the blog. Absolutely beautiful! 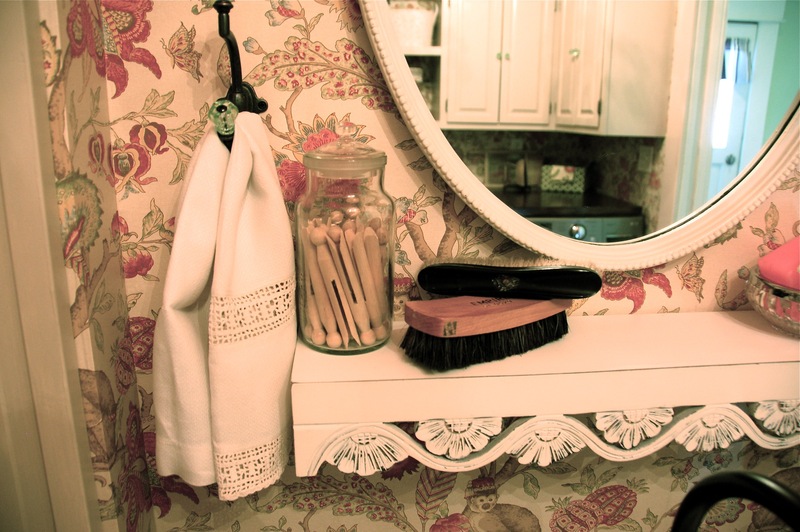 I love the way you were able to capture a bit of (vintage) elegance through the little embellishments such as the mirror, shelf and I LOVE those handles and knobs. Great Job! Thank you so much! It was a really, really fun space to create – I’m glad you love it! Oh, and I forgot to mention that wallpaper! I noticed the monkeys! I am sure that took a while to find, but it works perfectly! Again, great job..looking forward to your next project post! It was the most ridiculous find ever – it was perfect! 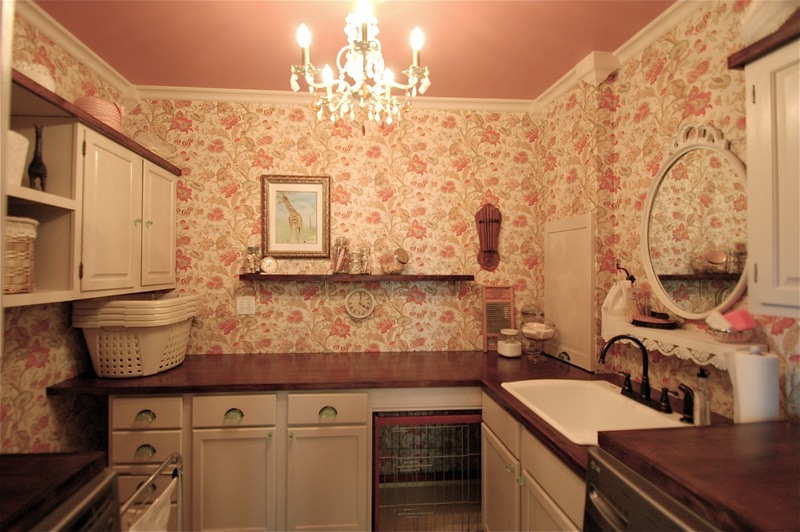 I think being over-the-top kitschy in a small space is fun. 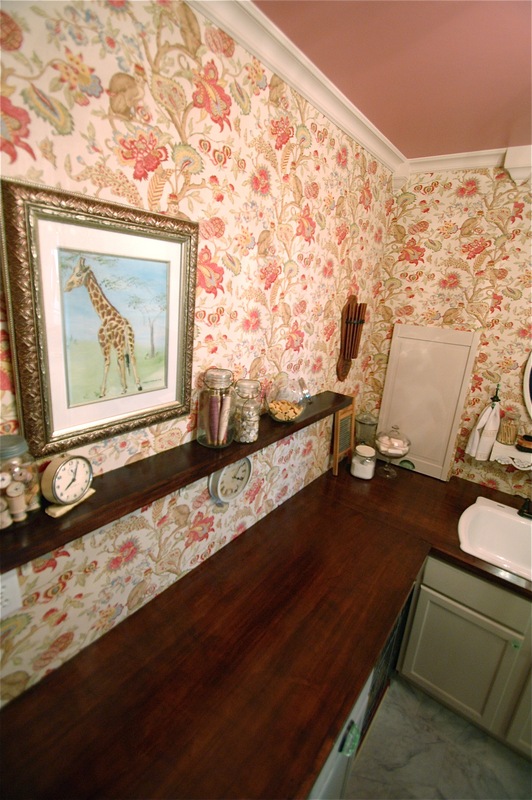 The best was trying to explain it to people : “I found wallpaper with monkeys on it! They’re wearing fezzes. It’s so great……. no, really, I promise. I know, it sounds awful, but you’ll love it….. really……” And they always did. As my father said, “You know, this doesn’t look nearly as awful as I thought it would.” Ha! Well it looks awesome! 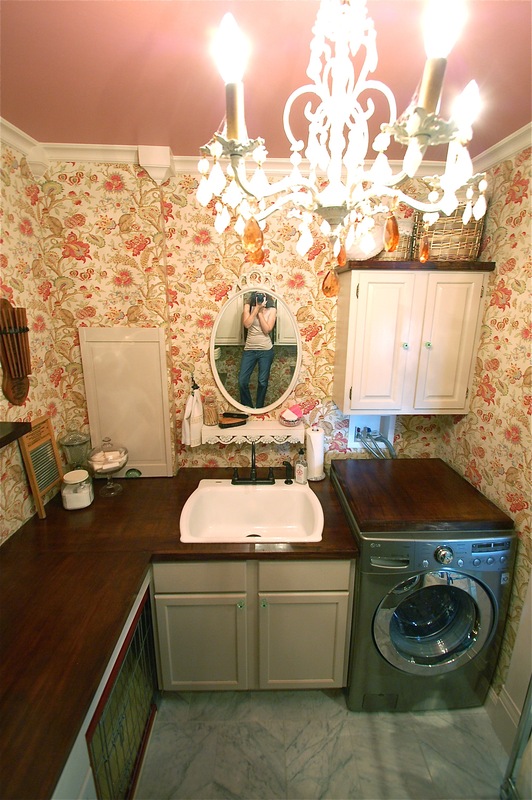 Having a room like that would (almost) make me motivated to actually do some laundry! 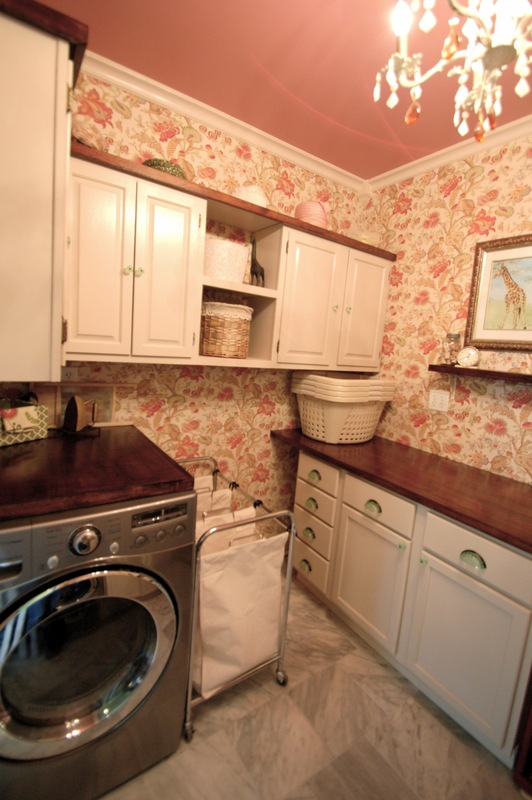 You should probably know this is my favorite laundry room OF ALL TIME. Not exaggerating. That is the best compliment ever. I’m pretty in love with it, too!!! 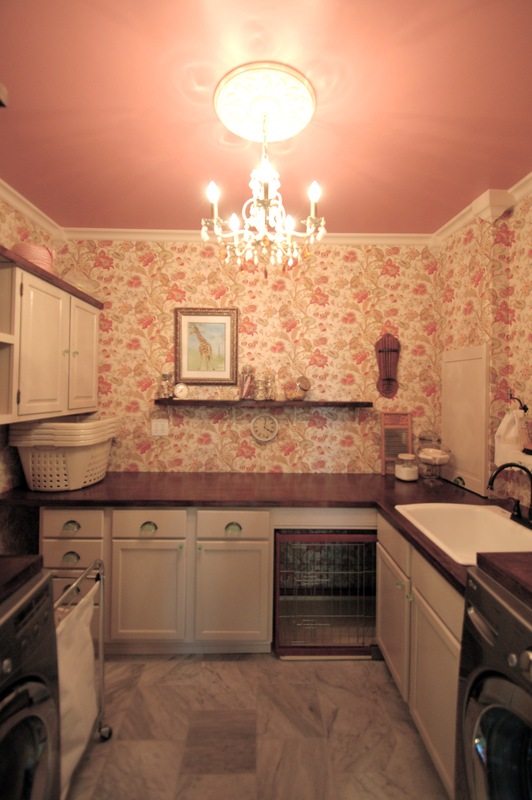 It’s probably my favorite room I’ve ever done (don’t tell the kitchen I said that, though…..). Bravo! Bravo! Just brilliant! I think it is incredible that you took a room normally wholly utilitarian and made it so special. LOVE IT! Wow! Thank you so much! I LOVE that you love it. It puts a smile on my face, so if it makes anyone else happy (or gives them ideas!) then I am the happiest. Thanks! 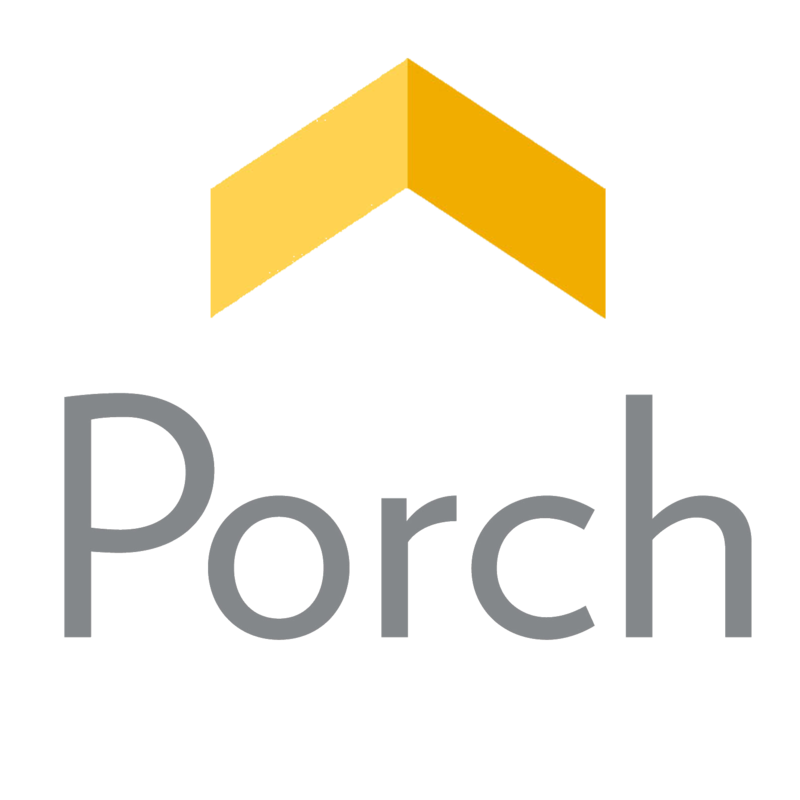 I know I’m late to the party, but I found your blog via a Google search for “home restoration blogs,” and I hope you’re satisfied because I’ve gotten NOTHING done for the past two days. I love your house so, so much. We bought a 1900 fixer upper in Pittsburgh, PA that we’ve been working on as time and money permit. 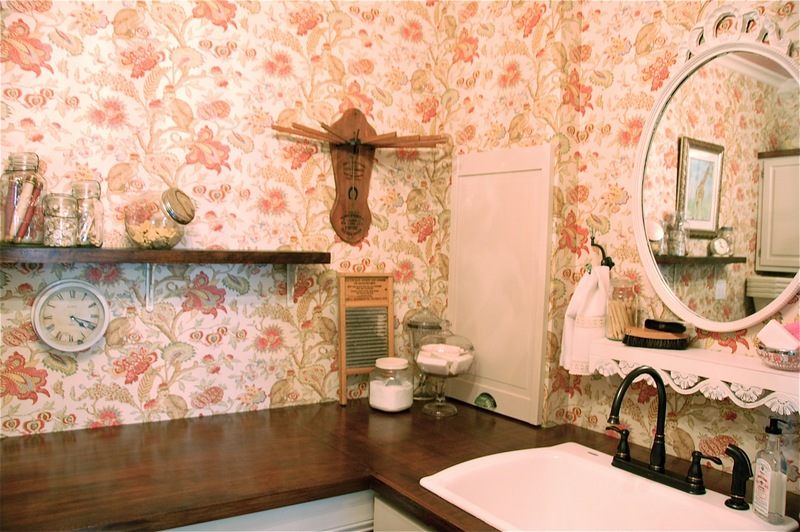 I’ve always had a really crappy attitude about wallpaper, but this laundry room is making me rethink it! It’s gorgeous, and everything in it is just perfect. Hi, Beth! Personally, I don’t think there is any such thing as being late to a party! 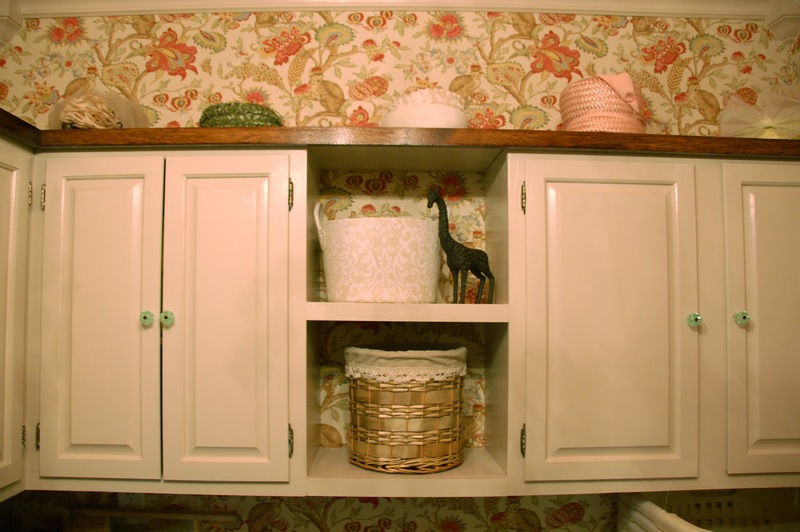 I used to not be crazy about wallpaper either (which is slightly crazy, because I LOVE texture and pattern, and it’s such a great way to get it!). 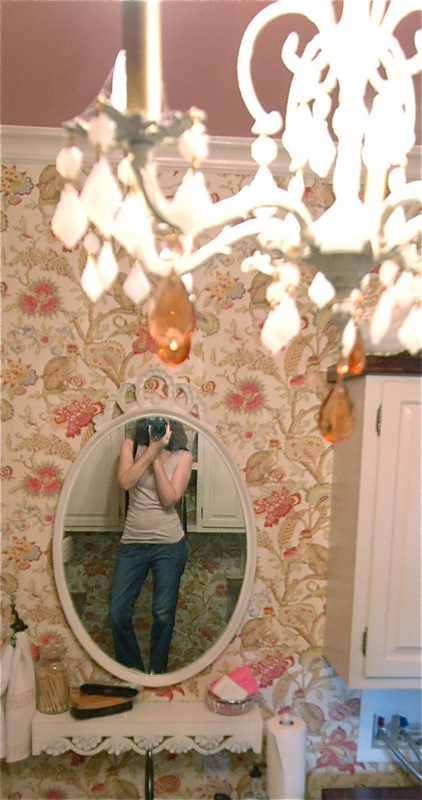 I didn’t totally embrace it until we moved into this house, with the super tall ceilings. The house really asked for it – and as always, the house is usually right. I would LOVE to see your house. I’ve been to Pittsburgh a couple of times, and there is such good architecture and history there! I can’t tell you how long it took me to finally find the monkeys, lol!! 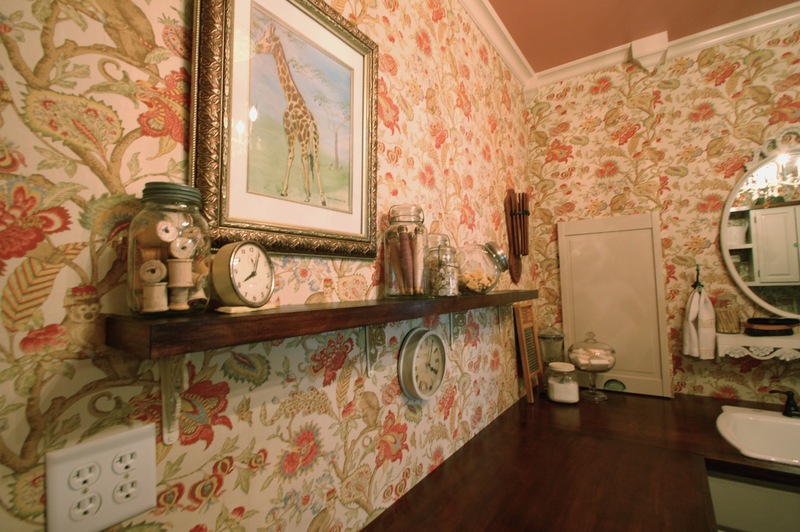 I’m another one that is not a fan of wallpaper but this room is so fun – I love it! I also love with you did with the giraffe painting – that is so special! I really enjoyed seeing this, thank you for sharing. Thank you so much, Kelly! I am so glad you loved it!!! I LOVE IT! Great job! I’d look for excuses to be in there. 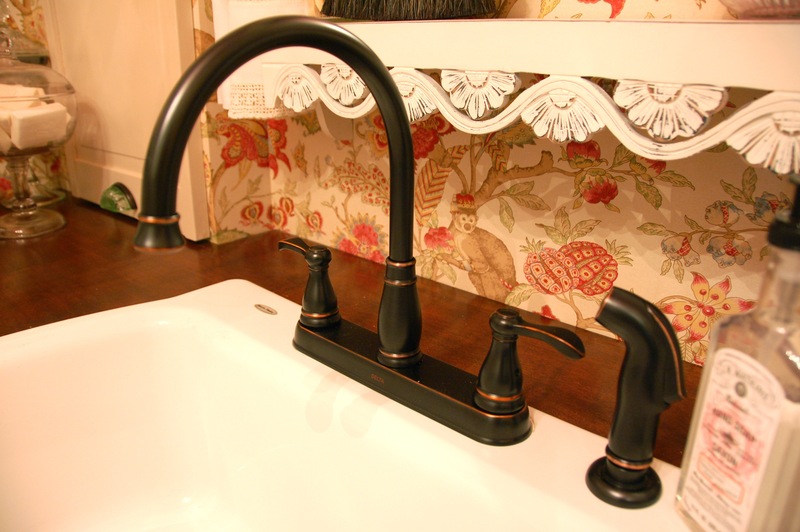 It’s so pretty and functional, a perfect blend of old and new! 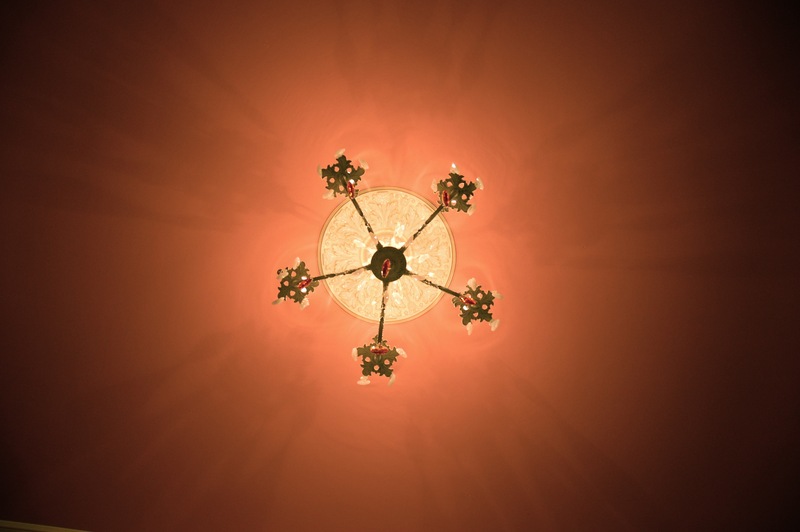 The swirls of light reflecting on the pink ceiling from the chandelier are beautiful. The monkey wallpaper is amazing. 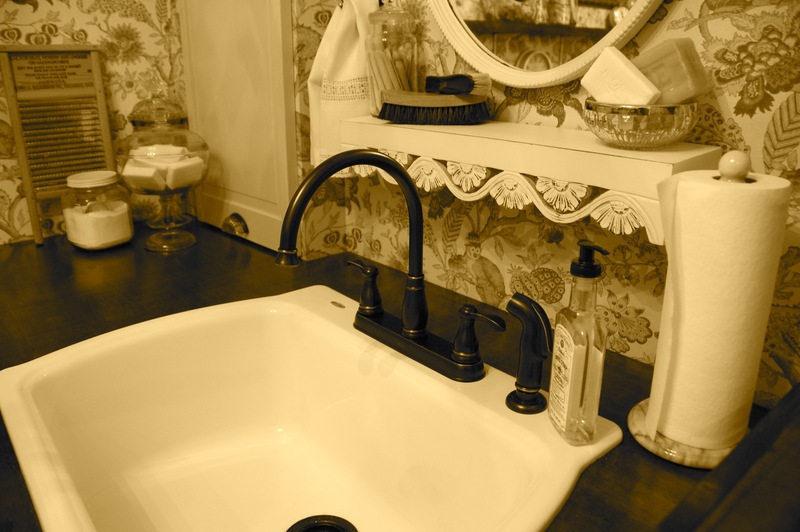 And I love the dark, contrasting wood and fixtures. 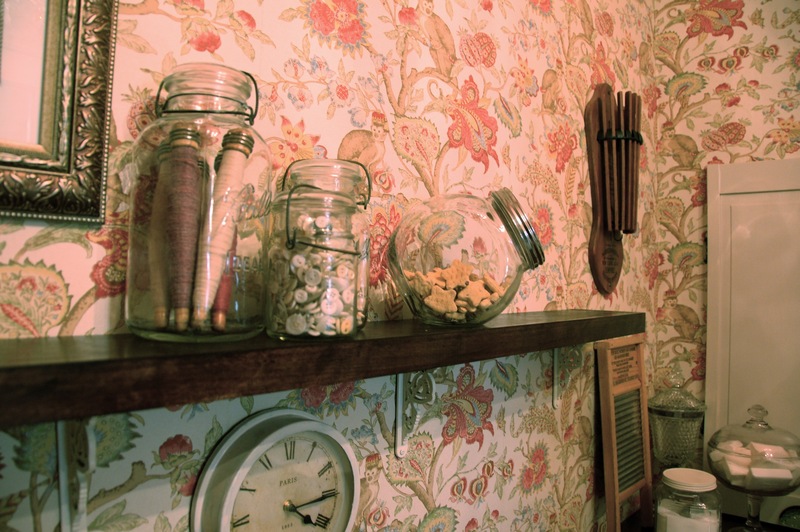 Also, the artful touches, antiques, hats and such are so well chosen and placed. Great design, very inspiring, the best I’ve ever seen! Thank you so much, Gia! I’m so glad you loved all the little touches! Well I too am late to the party. The two home restoration blogs I was reading both stalled, so I Googled “old house restoration blog” and yours was listed first in Country Living. I was hooked from the first page and have spent the last several hours binge-reading this blog. 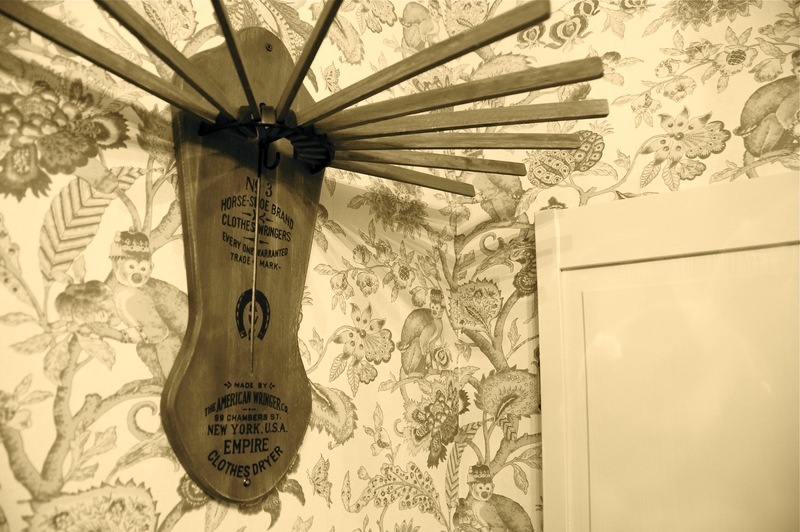 I love your writing, your humor, your style, and I super-love that beautiful Queen Anne house you are restoring. I shall live vicariously through you as I am in a McMansion with little charm. I also read that blog “McMansion Hell” and cringe as my home/neighborhood/town are derided humorously for their poor architecture. 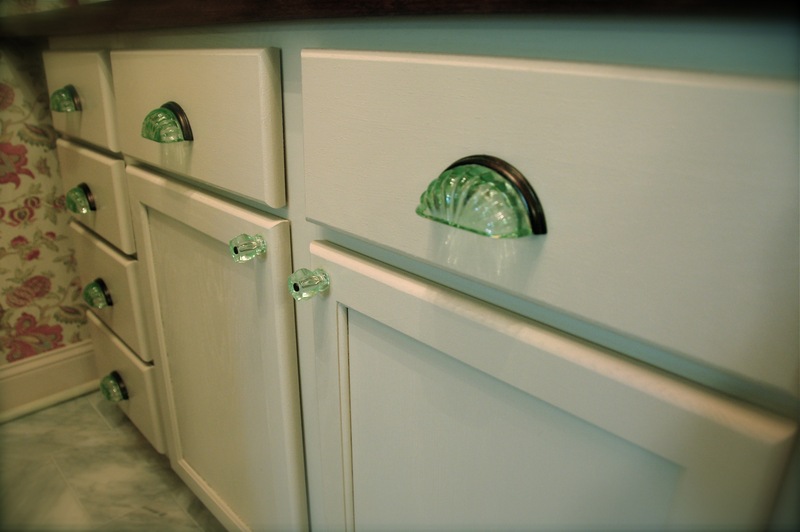 Your kitchen is stunning, but I’m partial to green. Didn’t think you could top that. 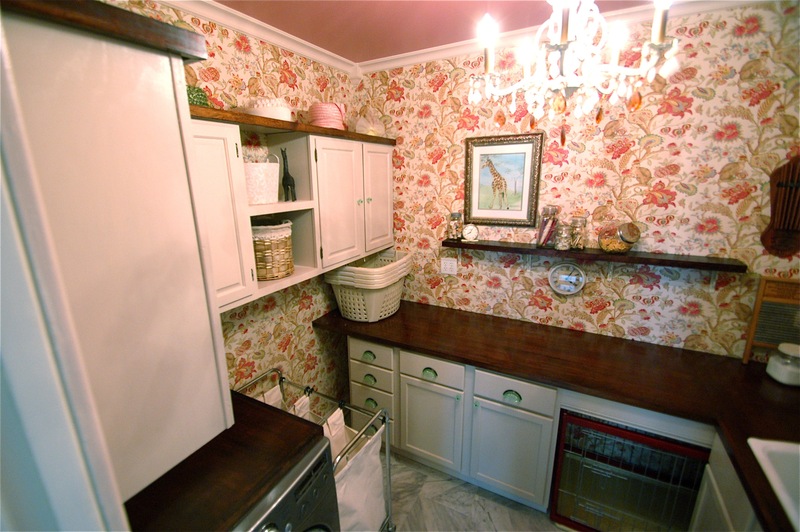 But holy schmolies, this laundry room! That room is better decorated than my whole house! Can I live there? The dog won’t mind, I’m a good snuggler. This comment MADE MY WEEK! 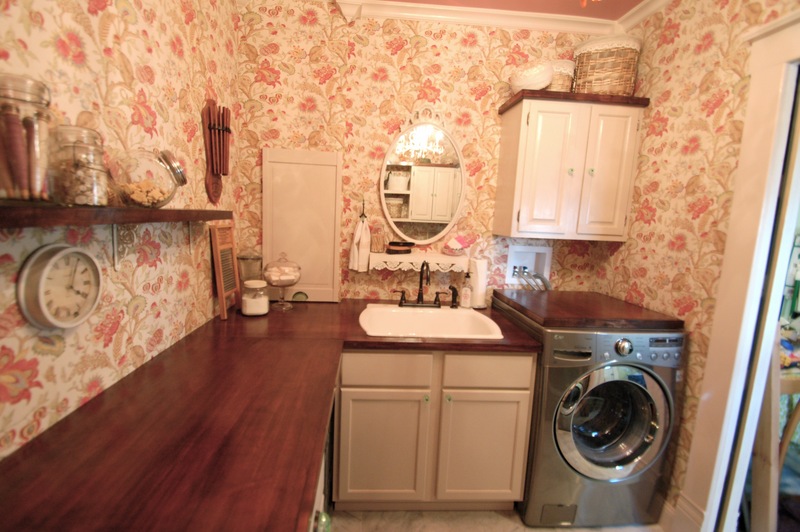 Yes, you can live in the laundry room. Marina will be thrilled with a fun new roommate! I’m so glad to have you reading along! Jo loves you. And, so do I! I love Doug, too! But Jo cares nothing for me! Sigh. Sigh!!!!!!! I feel all teary!